The Arizona desert, including the cities of Phoenix and Tucson, has a long growing season. It's possible to grow vegetables all year long–and many Arizona gardeners do just that. This summer you can plant a salsa garden in a container. The vegetables used as ingredients for salsa all have the same growing requirements. Choose a location for the pots that gets at least six hours of sun. Eight is optimum. Since the ingredients for salsa are warm season vegetables, they grow best during the summer. In Arizona this means that they require shade from the blistering sun. Place the pots where they will get morning sun and afternoon shade. 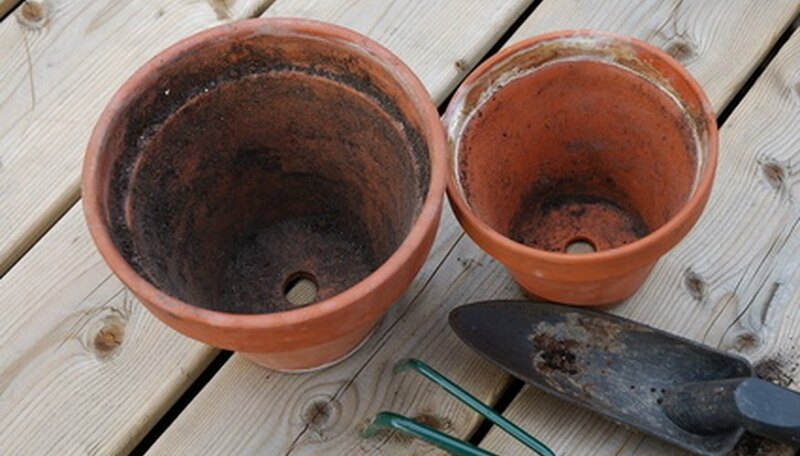 Fill the pots with fresh potting soil to within 2 inches of the rim of the pot. Water until the soil is soaked. Squeeze a handful of soil to test the moisture level. Select indeterminate tomatoes, they continue to grow and produce during most of the summer. Varieties include cherry tomatoes, which only need to be sliced in half for salsa. Different colored tomatoes are fun as well. Choose yellow, orange, chocolate or even white tomatoes. Smaller early varieties grow better in Arizona. Most tomatoes stop producing when temperatures are over 100 degrees F.
Cover the root ball and most of the stem with soil. This way the stem will root, which makes the plant stronger. Plant cilantro, garlic and green onions in one container. Plant garlic and onion sets so the growing tips are 1 inch under the soil. Sprinkle cilantro seed on top of the soil and then cover with 1/8 inch of soil. Water well. If it's early spring, cover the top of the soil with black plastic to retain heat. As soon as the seeds sprout remove the plastic. Place the green peppers and hot peppers in a third container. Choose earlier maturing varieties rather than later. Peppers may be harvested at any stage, even if they aren't full size. Check the pot's soil every day when temperatures are over 90 degrees F. If the soil is dry to a depth of 2 inches, it's time to water. Another sign that the plants need water is the soil pulling away from the sides of the pots. Don't use wilting as a sign the pot needs water. In mid-afternoon during the summer months, many plants wilt a bit from the hot Arizona sun even though their soil is moist. Fertilize every week with water-soluble fertilizer at half strength. When you have to water often you're washing some nutrients out. Deep water the plants once a month by filling the pot with water to the rim several times. Arizona's water is full of minerals. The minerals build up in the soil. Flush the minerals out once a month. Construct shade for the containers using shade cloth or light-colored sheets. Spray the tomatoes and peppers with a mist of water to help them set fruit. Tomato hornworms can destroy your plants quickly. Pick them off and drown in water.